↑ Church of Christ, Christian Church, and Disciples of Christ were names that were used interchangeably amongst members of a unified movement until the turn of the 20th century when they separated. ↑ McAlister & Tucker 1975, p. 252. 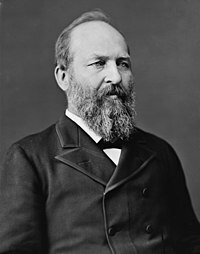 ↑ Frederic D. Schwarz "1881: President Garfield Shot," American Heritage, June/July 2006. หน้านี้แก้ไขล่าสุดเมื่อวันที่ 9 มกราคม 2562 เวลา 10:49 น.